Mia, Laala and Yui start getting excited. “Um, that seems pretty far-fetched, we should go take a look instead…” interjects Aira, as she starts heading towards the stage. As she gets closer, the audience’s cheers can be heard clearly, along with familiar voices… Turns out the ones using the stage are Rizumu and Mion, Aira’s friends and Mia’s mentors!! It seems they both got transported here by the Rainbow Bridge when visiting the Prism Stone shop in their original world. Mion, Aira and Rizumu are overjoyed to see each other again, and decide to perform “Hop! Step!! Jump!!!”. Thanks to their overwhelming performance, they manage to collect a great amount of Prism Sparkle! Happy Lucky!! Together with their Mion and Rizumu, the Pretty All Friends head to the next world!!! “Hey?! The sweets are all gone!! Did Mia sneakily stuff herself again?” Screams Naru as she opens the fridge. Looking around, she finds pieces of biscuit scattered on the ground. As they seem to form a trail, she decides to follow it and ends up in a forest. In the shade of one of the biggest tree, Naru finds a small live stage and multiple mascots, carrying the missing sweets. “Stop bossing us around and start working as well! !” says Rabichi as he kicks Kuma. 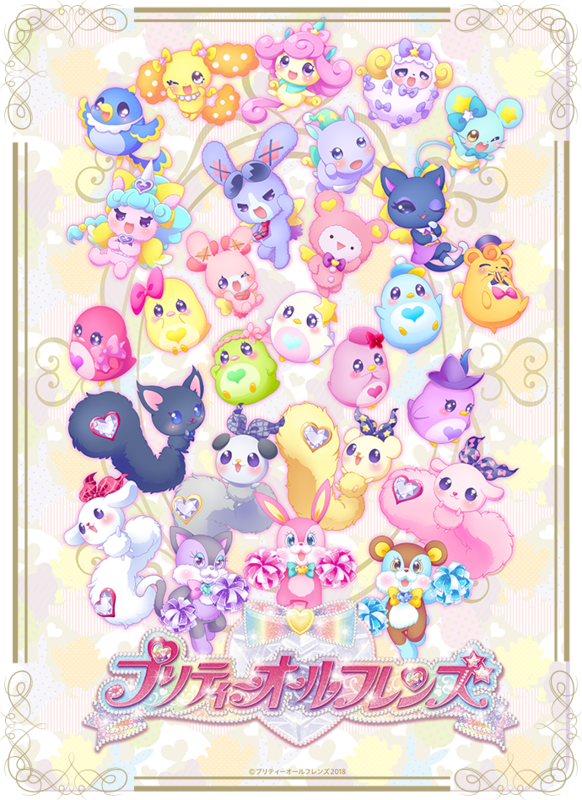 The mascots are preparing the “Prism Paradise Can Can”, a daylong festival where they dance and eat together. However, the preparations are in a complete stalemate. The mascots who can speak keep bickering with each other, and the mascots who can’t speak keep lazing around. Unable to bear such a pitiful sight, Naru gets on the stage. “Everyooone, let’s link our hands together! !” screams Naru. The mascots and Naru start singing “Heart♥Iro♥Tori Dre～am,” dancing and singing together, becoming Happy Naru! Thanks to Naru saving the day, the Prism Paradise Can Can could be held and she collected some Prism Sparkle as well! Impressions: I guess in the NEW Prism Trailer there’s a fridge and daily necessities facilities and stuff. And they were stopped in a weird place in-between worlds? or some unnamed world, and Naru got down the magic bus to reach the forest. Also the reference to French Can Can makes me convinced it’s Director Hishida writing these stories, he likes references to French things like that. Episode 2 with the MARs visual published on June 7 2018. Episode 3 with all the series’ mascots visual was published on July 1 2018. Hopefully the first week of August we’ll get an episode 4 with a Callings visual and episode. If they sadly don’t include the boys, next visual will probably be Serenon with K then. 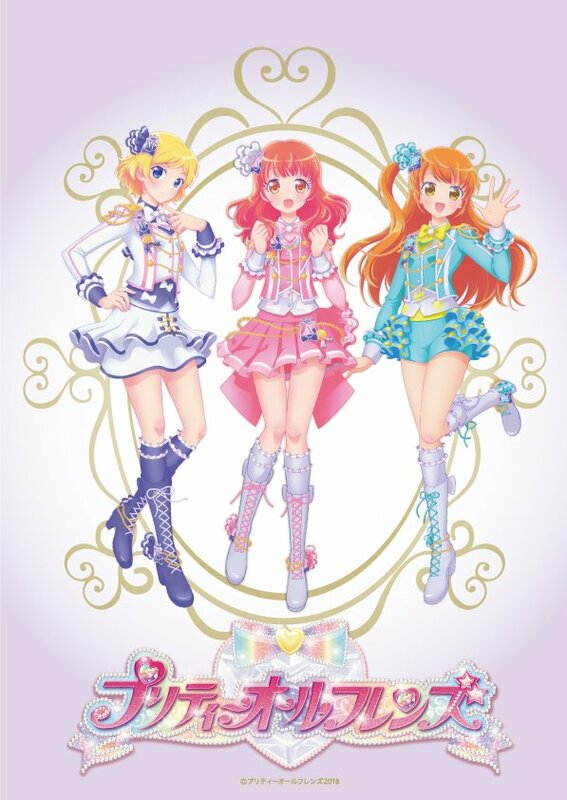 At least we’re sure all the girls will be in, as they included Mion and Rizumu, and the mascot episode has all the girls’ mascots on the key visual. You can find all episodes so far on TakaraTomy-Arts’ site. We still don’t know if PAF will just be text like that along with the cosmetics, or if they’ll make an tv anime, movie or game. On July 2, Duel Portal TCG news site also reported that Pretty All Friends cards of Aira Mia Naru Laala and Yui will be released on August 31. There’s been no official announcement though so I’m not sure what card game it’ll be for. The cards use the same illustrations as the first PAF key visual.